Las primeras rondas de hoy se jugarán de 17:30 a 23:10 (hora española). Today, the first rounds will be played from 17:30 to 23:10 (CET time). Y la segunda parte de las rondas preliminares se jugará de 00:15 a 5:55 de la mañana del jueves (hora española). And the second part of preliminary rounds will be played from 00:15 to 5:55 Thursday morning (CET time). Mañana las rondas eliminatorias comenzarán a las 17:00 hasta las 21:10, y la final a las 21:45 (hora española). Tomorrow, elimination rounds will start at 17:00 until 21:10, and the final match will kick off at 21:45 (CET time). Aquí tenéis el streaming de FFG, hasta las 17:30 de hoy no creo que esté operativo. Para los que no estéis familiarizados con Twitch, lo único que tenéis que hacer es darle al play y esperar a que pasen los anuncios. 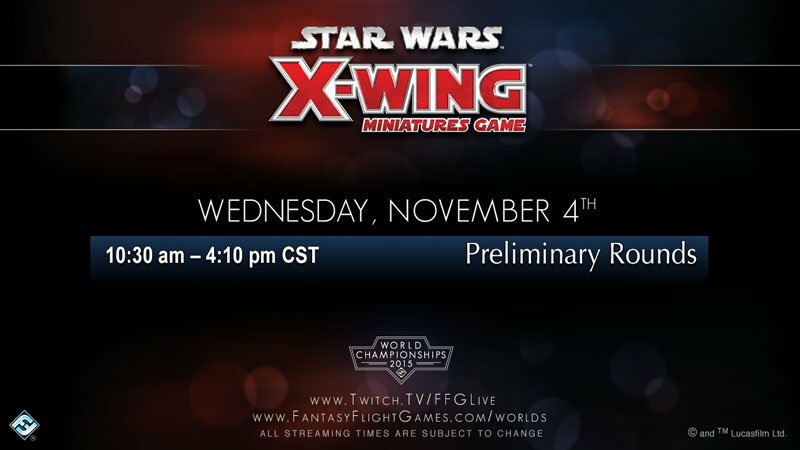 Here you have FFG’s streaming, I suppose it won’t be operative until 17:30 (CET time). For those of you who are not used to Twitch, you only have to click play and wait for the ads to end. 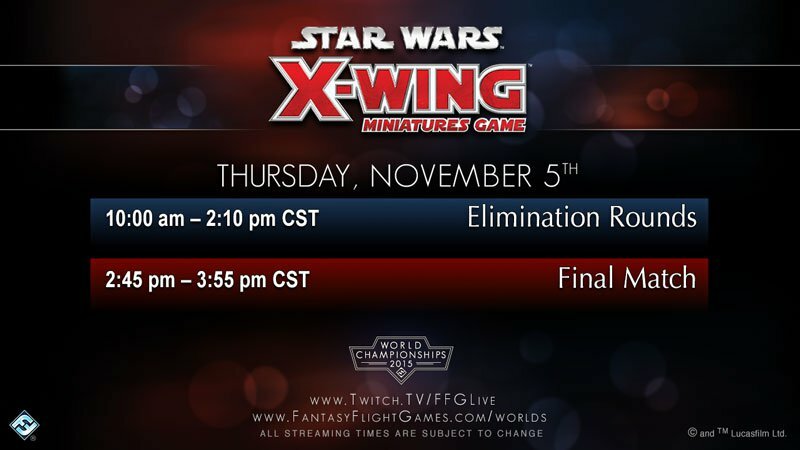 This entry was posted on Wednesday, November 4th, 2015 at 1:01 pm	and tagged with 2015, Directo, Fantasy Flight Games, FFG, Live, Mundiales, Worlds Championship, X-Wing Miniatures and posted in Competitivo, Live, X-Wing. You can follow any responses to this entry through the RSS 2.0 feed.